What are we to make of the recent flood of stories on religious extremism coming from Israel? Friction between religious and secular Israelis is not new, but recent events make one wonder if the country’s democratic foundation is being eroded by ultra-religious zealots, intent on forcing their brand of Judaism on everyone else. The incident that sparked much reportage and outrage occurred when an 8-year-old girl was harassed and spat on by haredi men as she walked to her modern Orthodox girls school in Beit Shemesh, a Jerusalem suburb. Apparently, her modest attire did not meet the haredi mens’ stringent standards. Prime Minister Netanyahu, Kadima party leader Tzipi Livni, President Shimon Peres, and Moshe Abutbul, the haredi mayor of Beit Shemesh condemned the haredi extremism. Groups in the U.S. were quick to respond too, including a statement by the haredi Orthodox umbrella body, Agudath Israel of America. A demonstration in Beit Shemesh against haredi extremism was organized, with several thousand secular and modern Orthodox Israelis attending. Among the messages conveyed on the protestors signs: “Silent Majority- Wake up!” A counter-demonstration of a few hundred Jerusalem haredi soon followed. Believing themselves to be the object of public incitement and hatred reminiscent of the Holocaust, haredi children were paraded about wearing yellow stars and striped uniforms. These shocking images unleashed a fresh wave of denunciations from mainstream Israeli leaders. “The question isn’t how many haredim support haredi violence and how many do not,” said sociologist Menachem Friedman, an expert on haredi life and professor emeritus at Bar-Ilan University. “In all the conflicts involving haredi violence in Israel, from the British Mandate period until today, violent haredim were always a small minority, and I believe that the vast majority feel uncomfortable about them. The specter of Jewish extremists using religion to justify appalling behavior will undoubtedly cause some, Jews and non-Jews, to smile smugly and say “You see? Jews are radicals too.” But such a conclusion misses the most important point. Of course we have extremists. Every group- Jews included- has its radical element. The question isn’t whether a group has radicals, but what the non-radical majority intend to do about it. First and foremost, there are laws in Israel that protect people from harassment, and they must be vigorously enforced. Are they? Some say that law enforcement’s response has been weak, that placating the governing coalition’s religious parties has a greater priority. Second, Haredi scholars, rabbis and leaders who oppose the actions of this minority have to back up words with deeds. For starters, they should accompany schoolgirls like the child in Beit Shemesh, and stare down the zealots that would harass them. They should use their influence to re-educate those Jews who have taken a beautiful heritage and twisted it into something that is hilul hashem, a desecration of God’s name, shaming us all. So far, it seems we are so desperately afraid of our external enemies that we’ll support at all costs a government that just watches as the country rots from within. Finally, and by no means is this the last word on the subject, a different take is offered by Caroline Glick of the Jerusalem Post. She cites encouraging evidence of increasing integration of the national religious and ultra-Orthodox into nonreligious institutions, including a conscription rate of 50% among ultra-Orthodox males (compared to a general conscription rate of 75% among 18 year old males). 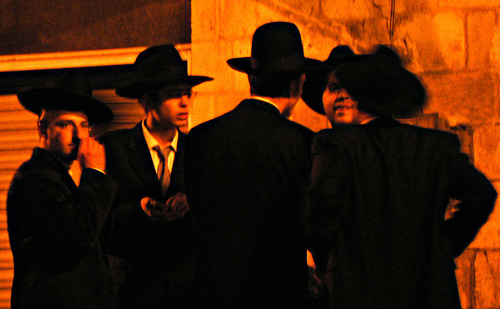 The IDF expects that rate of ultra-Orthodox conscription to rise to 65% by 2015. Glick notes that large numbers of ultra-Orthodox women have received vocational training in high tech and other martketable fields, and that more and more of their husbands are following them into the work force, lifting their families out of poverty. While decrying the bullying behavior of ultra-Orthodox extremists and calling upon law enforcement to fulfill its mission, she rejects the notion of an Israel that is unraveling. Is she simply telling us what we want to hear? Perhaps. Is she right? I certainly hope so. Because ultimately, it will take the cooperation of all segments of Israeli society to deal with the radicalism of our own people. Those of us who love Israel should expect no less. This is a guest post by Sally Abrams. Sally chairs the Speakers Bureau of the Jewish Community Relations Council. She has presented the program “Israel and the Middle East: the Challenge of Peace” at hundreds of churches, schools and civic groups throughout the Twin Cities and beyond. In the lobby of Intermedia Arts on Lyndale Avenue, chalkboards almost as tall as the high ceiling display vast maps of written pleas and assertions from its patrons. They resound with many handwritten hashtags relating to Black Lives Matter, such as #ICANTBREATHE and #HIREDONTFIRE. How do you make sure you're raising a feminist? Residents respond to railroad "pipeline on wheels"
Two years ago on July 6, an oil train explosion in Lac-Mégantic, Quebec, killed 47 people, and to prevent a similar catastrophe from occurring in Minnesota, Citizens Acting for Rail Safety-Twin Cities (CARS-TC) held a press conference in St. Paul on Tuesday, July 7, to address this threat in the Twin Cities. May is American Indian Month in Minneapolis. To celebrate thebeginning of the month and all the activities and celebrations that will follow, people and organizations gathered at Little Earth on Friday, May 1 for a parade through the Phillips Neighborhood. On July 30th, the Washington D.C.-based Southeast Asian Resource Action Center will convene a special community reception at the McNamara Alumni Center at the University of Minnesota. Part of the national 40 and Forward campaign, the reception will take place from 5:30-8:00 PM and will reflect on forty years of the Southeast Asian American journey. Israelis have recently gone to the polls in a contested Knesset election which will impact the country's policy agenda and the discourse around Israeli-Palestinian relations for years to come.Please join us for a discussion between J Street President Jeremy Ben-Ami and Humphrey School Professor Brian Atwood, chair of Global Policy and former dean. They will examine issues surrounding the outcome of the election and what this means for Israel's future, as well as the future for negotiations on Arab-Israeli peace.J Street, founded in 2008 with a stated aim of serving as the "Political Home for Pro-Peace, Pro-Israel Americans", has played an active role in the debate surrounding Arab-Israeli peace.